Millions of people around the globe search images both for personal use or work purpose.We offer you an online free tool for picture search that shows most similar images in no time. It not only offers the google images but go through Bing and Yandex as well. Upload any image from your system(computer or mobile device) or enter the image URL and get all the images that match your query image. How cool! Let’s suppose you are a movie blogger who reviews old movies for a website or blog, ever tried Google image search for an image from the film? This can help you find better angles and resolution. You can use image search to find out if someone has used your pictures without your permission or you can use it to find the original source of an image. Just use a photo as a sample query to find similar image from all around the web. 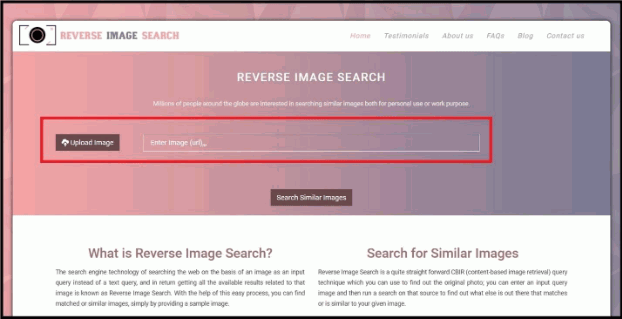 Reverse Image Search is a quite straight forward CBIR (content-based image retrieval) query technique which you can use to find original photo; you can enter an input query image and then run a search on that source to find out what else is out there that matches or is similar to your given image. It is a fact that a reverse lookup is not always up to the expectation, however, at times it helps a lot at discovering what we might be looking for and wouldn’t have found otherwise. It is a recommended trick to follow while not being sure what you are trying to find out. ReversImageSearch.com – How Does It Work? No doubt, there are quite a few picture search tools out there for regular search of images based on the text. But tools for search by image have slowly been growing in popularity and usage. Nothing can conduct an image search like a tool that is designed exclusively to serve the purpose. And, it is nothing like a standard Google image search which you might have used at some point in your life. Reverseimagesearch.com use image metadata and facial recognition techniques. It scans not just the image search engine databases, but also the millions of social profiles across the web including those of the popular social networking sites like Twitter, Facebook, Instagram, and other forums using a roundup of search by image. Hence, you may get all possible public results for your photo search at one place. It means This ensures the most accurate results and the best coverage when running a search by image on the internet. How To Search by Image ? Using our image finder is as easy as ABC! 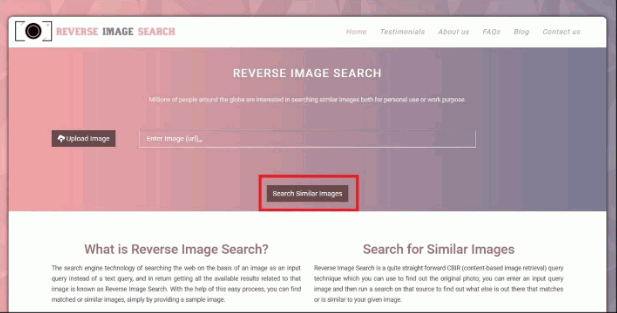 Try this reverse search and get to know how to reverse image search. We wanted to make an image search engine that is simple to understand and easy to use, which is the reason for keeping its interface user-friendly, responsive and compatible for all the devices and screens. Unlike other tools for reverse picture search or photo lookup, our tool doesn’t take a lot to use. Only a few simple steps, and voila, and you are all set! Get your query photos read, i.e. the images you want to search for. Get started by visiting: https://www.reverseimagesearch.com/ if you are not already there. Once you are there, upload your query image. There are two ways to that: “Upload Image” from your system or “Enter Image URL”. Initiate picture search by clicking on “Search Similar Images” button. That’s it! Once, you are done with clicking the button; our super smart algorithm will search Google, Bing, and Yandex for all the relevant images. Now you just have to click “Check Images” button for your preferred search engines. In many cases when a guest blogger is writing, he would just rewrite the content of an already existing article, and never go beyond. Many would even not take the trouble to remove the images from the source. Others would try to post the one article on various blogs, and there also are people who use someone’s images in a guest post and claim that it belongs to them.This reverse photo search can be handy to find all the similar images along with their resources. In all of these cases mentioned above, photo finder proves very helpful to locate the original content creator and the owner or the builder of the images. Therefore, when you come across an article with an image, use reverse image search to track down to whom it belongs and how many times the article has already been published. If you find a cropped image and wonder how the image would look without the crop; just search by image. This will help you find plenty of examples of the original image along with other cropped results. Many people would republish other’s infographic without even letting them know. You can track your mentions and backlinks which will be helpful to discover some of your promoters. However, there could be cases without backlinks or mentions, that’s when you should use similar picture finder or picture lookup to get additional help. It is a safe and easy way to find unlinked re-use of your work, and you can even reach out to the user to ask for credit (or link). A healthy link building tip is that whenever you find that someone has re-used your image content, send them a nice, friendly email or message to let them know that you permit them if you are credited with the link. Most people engaged in copyright infringement are not doing that on purpose, they will be happy to credit you. Any photographer with his work available online has to deal with a lot of people who re-use the work on their sites and blogs, sometimes without even giving a proper mention. Reverse image lookup is a great Photo Finder Tool to discover such re-uses and may result in some pretty good deals. You can easily find products or the recipes that you have seen online or in the shop and would like to buy. If you see something on a website like a recipe or a product which isn’t linked to a product page, you can use search by image to buy products with the help of an image. In this digital era, the biggest concern of any user is his/her safety. We understand that and respect your privacy. Hence, we do not store in our database, share or sell any of your pictures that you upload to the site. So, you can rest assured that all your information and photos is in safe hands.